Marysville School Board member Vanessa Edwards, left, and Marysville-Pilchuck High School student Christopher Hackmann talk at a Coffee with Constituents on March 9. Arlington maintenance workers Dan Foster, right, and Ben Stieben shovel dirt into one of the garden beds that will be part of the new Arlington community garden on March 6. Marysville Getchell High School students Samantha Sanchez, left, and Melina Westover gather plastic bottles from the school’s recycling on March 7 to measure how much waste the schools produces in a day. 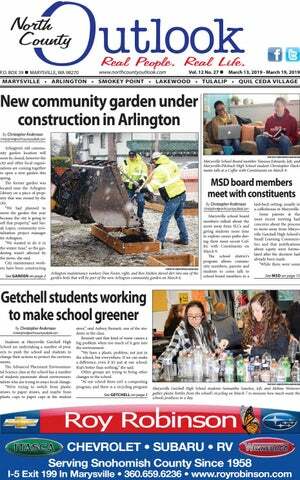 garden boxes and putting them at their new location with help from the Arlington School District, which provided the space at 315 N. French Ave., Arlington, next to their administration building and Presidents Elementary. “It’s going really smoothly,” said Lopez, who added they hope to finish the project in the spring so local gardeners can use the location. City workers have put in water lines, constructed garden boxes and filled them with soil donated from the Gayteway Business Park currently under construction. munity garden than before. “Since it’s a much bigger area, that is a lot more potential for more gardening options,” she said. Lopez and Countryman have been working on the design and how the garden will fit within other organizations as well. Currently they have 42 garden beds planned for community members, and some for other groups as well. “We will have a few different areas of the community garden,” said Countryman. That includes an area set aside to grow food for the Arlington Community Food Bank. Another space will be reserved for students from the Arlington School District. “There will be a space for the school, and we’re still working on how that will play out exactly,” said Countryman. “We’ve met with the school district about what the teachers want and what their programs will look like,” said Lopez. Science, botany and other types of lessons could be done with help from the garden, said Lopez. Some of the food grown by the schools may go to the Arlington Community Food Bank as well. Countryman isn’t sure if there will be vacant spots available yet or not, but she has a waiting list for the garden. “Unfortunately we’re not yet at the point where I can place people, so I don’t know if there will be vacant spots left,” she said. If you are interested in a spot on the waiting list for the garden you can call Beth Countryman at 360-4352991. 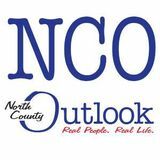 In the Feb. 27 issue of the North County Outlook, the story “Steelheads prepare for upcoming season” incorrectly listed that the Lacey FC match is on May 28, it is actually on Sunday, May 26. For more information on Snohomish County FC go to www.SnoCoFC. com. the ballot,” said Mennie. Information will also be available through handouts and through a short presentation scheduled for 5 p.m. at both events. “The presentation is not required though. These aren't going to be very formal and will be casual,” said Mennie. There are about 12 RFAs in the state of Washington, many of which have formed in the last decade, such as South Snohomish County Fire and Rescue, which was created in 2017 in the Edmonds and Lynnwood region. "It's sort of become the model a lot of growing communities are growing toward,” said Mennie. Mennie said that the public response has been good when interacting with the public. "So far the reception has been pretty positive. A lot of people seem to understand that the last few years our expenses have outpaced our revenues and you can't keep running fire services like that,” she said. More information about the RFA measure is available at marysvillewa. gov/783. as white, approximately 19-years-old, around six feet tall and thin, with a pockmarked complexion and long brown hair pulled up inside a beanie cap. He was also wearing jeans and a gray sweatshirt. According to the victim, the male possibly uses the nickname “Lucky.” The female, also estimated to be about 19-years-old and white, has a thin build and long brown hair. She was reportedly wearing dark high heels, stretch pants, and a white Adidas Jacket. The victim is recovering from multiple skull fractures as a result of the assault. Anyone with any information regarding this incident or the identity of either of the two suspects is encouraged to contact Detective Cori Shackleton at 360363-8364 or email cshackleton@marysvillewa.gov, or call 911 and ask to speak with a Marysville Officer. I’m doing something good and that will last for a while,” said Smith. “It gives me a sense of purpose because I want to do this as a career and this is just one step of doing it everywhere,” said Russell. Bearcats at home on Thursday, March 14, at 4 p.m. The Eagles will have their first home game of the season against the Cascade Bruins on Friday, March 15, at 4 p.m. If you want to cheer on Lakewood their next home game will be against the Squalicum Storm on Tuesday, March 19, at 4:30 p.m.
March 14	Lynnwood	Home	QuilCeda* March 16	Bellingham	Home	QuilCeda** March 19	Edmonds-Woodway	Away	EdStad *Match begins at 7 p.m. **Match begins at 1 p.m.
March 14	Lake Stevens	March 19	Mountlake Terrace	*Match begins at 3:45 p.m.
March 13	Squalicum	March 15	Cascade	March 18	Glacier Peak	*Game begins at 4:30 p.m.
March 16	Bremerton	March 19	Meridian	*Match begins at 1 p.m.
Meet begins at 4 p.m.
March 14	Granite Falls	Away	GFHS* March 16	Coupeville	Away	CHS** March 19	Squalicum	Home	LWHS *Game begins at 4 p.m. **Game begins at 1 p.m. Match begins at 11:30 a.m.
cord, and battling their way into the State Tournament. In the offseason they lost five senior starters but return the majority of their very experienced roster. Behind nine seniors and a long list of talented young players, Arlington looks poised for another successful year. “We need to come out and play well. As long as we take care of the things we can control I think we’ll do really well this year,” said Coach Striegel. If you want to come out and support the Eagles their next home game will be against the Marysville Getchell Chargers on Friday, March 15, at 4 p.m.
Arlington’s sophomore pitcher Jacob Burkett gets a strikeout in the first inning against Ingraham at Monroe High School on March 8. Arlington’s junior pitcher Luke Green gets a strikeout against Ingraham in the third inning at Monroe High School on March 8.
on that field. I’m really excited about this group,” said Coach Anderson. If you want to come out and support the Cougars their next home match will be against the Meridian Trojans on Tuesday, March 19, at 7 p.m.
Juan Corrales, Lakewood’s junior mid, uses his speed to get past the Spartan defense and advance the ball upfield at Lakewood High School on March 7.
when trees are in full bloom. Weeding: In addition to pruning, weeding is just as important. Remember the old adage: “A stitch in time saves nine." Pull out every last clump of “shot weed” you can find before it goes to seed, same for chick weed and henbit. These weeds germinated last fall and if you had applied a mulch, you wouldn’t be dealing with them now — remember that this coming September. Once you you’ve got the beds cleaned up, get some mulch on the surface before more seeds germinate. Planting: While pruning and weeding are clearly the primary tasked to be completed this month, I like to throw in planting simply because we should always be planting new treasures into our gardens. We are blessed with a mild climate (well except maybe for the last month) where we can literally plant year around. Don’t worry about a few mild frosts, they won’t hurt shrubs and trees or hardy perennials. Garden centers are loading up with early blooming plants like Arabis, candy tuft, and Aubrietia. They will be gone by April, so for a garden that will delight you 12 months a year, shop early, late, and often you will be richly rewarded for your efforts. Improving your home's curb appeal An attractive front entrance area gives a home curb appeal that invites both guests and potential home buyers. Upgrading a home’s exterior can be as simple as painting or as complex as installing new windows or adding a patio. A potential home-buyer's first impression is extremely important and that impression forms before they even walk into a house. to wash the windows and make them shine," Peterson said. He added that moss has to be removed from the home's roof. Peterson said in an email that nothing looks worse than moss on a roof and it makes it look like a homeowner doesn't take care of their house. To further help a potential buyer's first impressions, preparing a home for sale will also mean decluttering a house and depersonalizing. Clear items from countertops in kitchens and bathrooms. In keeping with the concept of "less is more," remove personal items from walls and shelves and place excess furniture and items into storage. The amount of clutter a potential buyer will influence their impression of a home's condition. Once a homeowner decides to sell their home, there relationship with the house changes. "You almost have to treat it like a business transaction," Peterson said. The are a variety of projects you can do to improve your home's curb appeal. details. Find out which architectural elements will meld with the style of the home and then incorporate them. Moldings, columns, shutters, and trim are areas to consider. The entryway to a home garners a lot of attention. Homeowners can enhance their spaces with entryways that really make a statement. 2007 and was developed by talking with landlords, said Rankin. “We actually went out and asked the managers what are the biggest challenges for renters getting into a place,” he said. Snohomish County has supported it since then, with the local Volunteers of America running it. “We pitched it to the county and it has been successful enough that they support us with grant money every year,” said Rankin. Although it is something important for many people, tenant rights and how to manage housing is something that not many know much about. “It’s not really something that is taught in schools, and how to navigate these renting issues is such an integral part of so many people’s lives,” said Rankin. More information about the program is available at https://www.voaww.org/ rentercertification. Douglas is the Best Friend of Dan Campbell. Marysville Mayor Jon Nehring, right, presents Jodi Hiatt with the city's Volunteer of the Month award. ety and Red Curtain Arts Center. Other volunteers appreciate that Jodi steps up to take on challenges and continually works to create a culture of teamwork. “Thank you, Jodi, for continually working to make Marysville a better place,” said Mayor Jon Nehring as he presented the award at the Feb. 25 Marysville City Council meeting. The Arlington High School Neobots Robotics Team competed in the FIRST Robotics Mt. Vernon District Tournament March 1-3 Thirty-two teams from Washington state participated in the competition. The Neobots team made it to the quarterfinals of the competition with their robot nicknamed “Berg.” The Neobots team finished the competition with a record of 4-10-0. “The students have been working hard on Berg and the robot performed well during the competition,” said Mark Ehrhardt, team advisor. “The students will now evaluate what worked well and what needs more work.” Thirty-five students currently participate on the Neobots team. They will be competing again this year at the West Valley District Tournament in Spokane, March 21-23.
space. In 2019, we funded the following projects in North Snohomish County: $50,000 for ballfield improvements at Cedar Field in Marysville, $40,000 for improvements at Terrace Park in Arlington, $35,000 for improvements at Frank Mason Park in Granite Falls, and $25,000 for ballfield improvements at Whitehorse Park in Darrington. The Whitehorse Regional Trail is a staple for North Snohomish County’s park and trail system. This 27-mile stretch of trail between the City of Arlington and Town of Darrington provides amazing scenery of the Cascade Mountain Range, the Stillaguamish River, and everything in between. This three phase project includes trail and bridge rehabilitation, Highway 530 crossings, paving in certain areas, and more trailheads and access. The 2019 budget includes $1,032,291 for these improvements. More about these projects and other parks projects throughout the county can be found by visiting https://snohomishcountywa.gov/2703/ Current-Projects Nate Nehring is a member of the Snohomish County Council and represents District 1 which includes Arlington, Darrington, Granite Falls, Marysville, Stanwood, and unincorporated north county. He can be reached by email at Nate. Nehring@snoco.org or by phone at (425) 388-3494. Our Favorite Quotes "Don't tell me what you believe in. I'll observe you behave and I will make my own determination." Author ­— Alex Trebek Submitted by North County Outlook editor Scott Frank. RAVE: It's great that Paine Field has started offering commercial flights. It will be so much more convenient than having to drive all the way down to SeaTac. RAVE: The recent sunny (albeit chilly) weather is a reminder that spring is just about one week away. I'm definitely looking forward to winter finally being over. research and found what all the other cities did,” he said. Nehring said city staff wanted to provide low-income people with disabilities the same benefits that other area cities offer. “We looked and thought that if someone is in that situation we want to give them the same threshold that other cities are giving them,” said Nehring. "We wanted to provide that rate relief for the people in our community who financially are probably finding it very difficult to make ends meet,” said Mennie. City officials wanted to help those people and Mennie said city staff researched what was causing the disparity. "Our city staff looked into why that was and discovered we were using a different set of guidelines about who can qualify,” she said. We looked and thought that if someone is in that situation we want to give them the same threshold that other cities are giving them. $15,000 or less to qualify, but now that threshold is raised to $37,000. For a family of four the old guidelines set the limit to about $31,000, but now it is about $53,000. "So a lot more people would be able to qualify under the new guidelines,” said Mennie. The utility rate reduction will cover water, sewer and stormwater fees and garbage fees if you’re provided service by the city of Marysville (some areas within city limits are provided service by Waste Management). To qualify for the reduction you have to show that you’re disabled, either by providing a disabled parking placard or through other means. Mennie said that city staff can help guide individuals through the forms to show that. The forms to apply for the reduction can be found at marysvillewa.gov, by calling 360-363-8001 or at Marysville City Hall at 1049 State Ave. #101, Marysville. Time to get your Irish on at the Third Annual Magical Strings Celtic Gala on March 15. This festive and timeless realm of Celtic music, dance, storytelling and songs will have you jigging all the way home The event will be 7:309:30 p.m., doors open at 6:45 p.m., at the Marysville Opera House, 1225 Third St. Tickets are on sale now and cost $18 per person. To pre-purchase tickets go to https://apm.activecommunities.com/marysvillewa/Activity_Search/4349 Online sales will end on March 15 at 4 p.m. Tickets will be sold at the door if still available. Beer, wine and refreshments will be available for purchase through the Marysville Soroptimists. For more information please visit marysvillewa. gov or call the Parks and Recreation Office at 360363-8400.
ton Library, 135 N. Washington Ave. Soil Science and Plant Nutrition - With the WSU Master Gardeners: Learn soil and compost tips from the WSU Master Gardeners. Held Wednesday, March 13 beginning at 5 p.m., at the Arlington Library, 135 N. Washington Ave.
A PLACE FOR MOM has helped over a million families find senior living. Our trusted, local advisors help find solutions to your unique needs at no cost to you. Call 855415-4148. ADOPTION: FAMILY ISN’T ALWAYS about giving birth, it’s about giving love! Loving, Single, Mother looking to adopt a newborn. Expenses paid. Call /Text 917-7456945. DONATE YOUR CAR TO CHARITY. Receive maximum value of write off for your taxes. Running or not! All conditions accepted. Free pickup. Call for details, 855-6354229. WASHINGTON DIVORCE-SEPARATION, $130. $175 with children. NO COURT APPEARANCES. Includes property, bills, custody, support. Complete preparation of documents. Legal Alternatives, 503-772-5295. www. paralegalalternatives.com. will be held Thursdays, March 14 & 28, beginning at 2 p.m., at the Marysville Library, 6120 Grove St. This two-part grant writing workshop helps you perfect your ability to craft proposals that effectively and successfully deliver your organization’s message to potential funders. Session One: Crafting Proposals That Pack a Punch (March 14) Session Two: From Budgets to Attachments, Character Counts, and Balancing Stats with Stories (March 28). Please preregister as space is limited. For more information call 360-658-5000 Toddler Storytime: Jump and bounce into a magical world of stories, music, and movements that nurture the desire to read in toddlers. For ages 19 months to 3 years. Caregiver required. Held Mondays, March 18 and 25, beginning at 10:30 a.m., at the Arlington Library, 135 N. Washington Ave.
www.northcountyoutlook.com at the Arlington Library, 135 N. Washington Ave. Waggin’ Tales: Read a tale or two with Arlington's favorite registered therapy pets! For children and families. Held Saturday, March 23, beginning at 11 a.m., at the Arlington Library, 135 N. Washington Ave. Saturday STEM - Peep Engineering Challenge: Use your engineering skills to build a jellybean structure for your Peeps and design a launcher to help them fly! For ages 6 and up. Held Saturday, March 23, at 2 p.m., at the Arlington Library, 135 N. Washington Ave. Class of 1979 Reunion: Marysville Pilchuck High School Class of 1979 40year reunion will be held July 27, 2019, at the Marysville Opera House, 3-10 p.m. and will include dinner and fun. RSVP required by 4/28/2019. Cost is $65 per person. For ticket and more information email classof79-40@hotmail.com. Jam Session for People with Disabilities: Youth and adults of all abilities are invited to Village Music and Arts Friday jam sessions featuring live music by Jon Dalgarn and Voices of the Village. Bring your own instrument or use theirs. Sessions are every Friday, 1 p.m. to 3 p.m. at 338 North McLeod, Arlington, WA. Children under the age of 16 must be accompanied by a parent or caregiver. Call Michelle at 360-653-7752 ext. 14 for more information or to sign up. Pills Anonymous Meeting: Do you now, or have you ever had a problem with prescription pills. If so, the join the new book study Pills Anonymous Meeting. Held on Mondays, 5-6 p.m., at the Peace Lutheran Church, 1717 Larson Rd., in Silvana. For more information contact Barry at 951212-4080 or Virginia at 360631-5142. Pills Anonymous is a fellowship of mine and women who share their experience, strength and hope with each other so they may solve their common problem and help others recover from pill addiction. The only requirement for membership is a desire to stop using pills. Family Night to Battle Addiction: The Tulalip Tribes Family Services runs their “Family Night” on the last Tuesday of every month. The dinner and discussion night provides information, support and community ideas on how to help loved ones in their battles with addiction. From 5:30 p.m. to 7 p.m. at the Juanita AnnJones Morales building at 2821 Mission Hill Road, Tulalip. Call 360-716-4400 to RSVP. flexibility in their class choices. "We know that often electives are what inspire kids to go to school, so with more classes you would have the opportunity to take more electives as well," he said. Because of the planning period that teachers need, a trimester system would require the district hire more staff which would mean about $800,000 more if implemented across the district, said Lundberg. "We would have to be prioritizing our budget if that's what we decide to do," he said. The school district has been holding Coffee with Constituents meetings since the start of the year to help the school board talk directly to parents. "These meetings help the board understand what the community wishes are and I think that is the huge value in this. It's relaxed and you can say whatever you want," said Lundberg. Marysville School Board member Pete Lundberg talks at a recent Coffee with Constituents on March 9. Community members also liked the casual setting. "I thought it was really good. Kind of a unique opportunity directly from the horse's mouth what they're thinking," said local parent Mark Indrebo. "I appreciated the honesty," said local parent Kelly Indrebo. DECOR, FASHION & FUN Mention this ad for 25% off one item of your choice! New M'ville business sells CBD products By Christopher Andersson christopher@northcountyoutlook.com A variety of CBD products that many people say can help with chronic pain or other medical issues are available at recently opened Marysville business New World Distributors. CBD, or cannabidiol, is a component of marijuana, however it doesn’t cause the high typically associated with cannabis, which is instead caused by THC. The Marysville store at 9109 State Ave., carries a number of products with CBD, but none with THC. Many of the medical purposes that marijuana is used for are provided by CBD. “There’s a wide range of conditions that it helps with,” said owner David Day, which include chronic pain, anxiety, Chrohn’s disease, diabetes, rheumatoid arthritis, antibiotic-resistant infections and other problems. David Day, owner of New World Distributors, at his recently opened Marysville business that sells a variety of CBD products. works best,” he said. Day is a long-time Marysville resident and said he is happy to open a business that he feels can help a lot of people in the community. “It’s great to be accepted into the community. It took so long and there is a need in the community for this product, not just for the older folks but the younger folks,” he said.